Being artistic and having some creativity with crafts runs in our family, well at least to my brother and most of my first cousins. My cousin has a gift for all kinds of artistic skills including painting with pastels and charcoal, and also with graphic arts, signs and everything you want done with the use of his magical hands. He’s really perfect in his skills and talents. My other cousins and their kids inherited the same skills and even though they finished college in other fields of study, they have all gotten back to using art in current their jobs. I guess some people just want to work where their hearts are. As to our own family my brother has the best art talent of all of us, with my sister and I having some drawing and lettering skills. All of my kids are showing skills in that area too. I smile when I think of how artistic talent is passed on through generations. Well I hope these skills transfer to other areas, such as learning ceramic arts as I just love so many of those beautiful hand crafted pottery items. As I may have said before, I can always use some more unique pots for my flowers and plants, so I am hoping to try my artistic skills with some pottery lessons one day. I think taking a ceramic arts class will be the best as then I learn about different clays and using throwing wheels, slab rollers, and kilns. 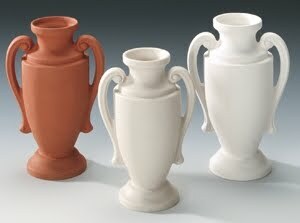 I got some information about pottery making online at AMACO/Brent. This amazing website sells everything having to do with pottery from clays, glazes, and ware carts to throwing wheels, kilns, wheel replacement parts and more. They have all of the equipment, tools and accessories you’ll ever need for ceramic arts, along with many resources for teaching clay art such as art lessons, videos, dvds and instructional books. I know I have a lot to learn before I make my first flower pot, but I am going to be looking for a ceramic arts class in my area. Its always good to be learning new things, and I think I'll especially enjoy calling on my artistic talents to see what I can do.